This July has been a particularly tragic month along Santiago Canyon Road for motorcyclists, with three reported fatalities in the five-mile stretch between Silverado Canyon Road and Modjeska Grade Road. All three accidents occurred within a one-week period, and each time involved a collision with a car or truck. Keep a safe distance. Motorcycles are lighter and thereby carry less momentum than your car, meaning that they can come to a stop in a much shorter distance than you can. 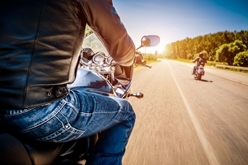 Even a relatively mild rear-end strike can throw a motorcycle rider off his or her vehicle or push the bike into oncoming traffic, so don’t follow too closely. Pass with care. If you have to pass a motorcycle, be sure to allow plenty of room so that you don’t accidentally strike the handlebars with your side mirrors. Make sure that there is ample room between you and the motorcycle before merging back into the same lane, too, so that the rider can maintain a safe following distance. Don’t interfere with lane splitting. Lane splitting or “filtering” is when a motorcycle passes another vehicle in the same lane while traveling in the same direction. This is a completely legal behavior in California, and the National Highway Traffic Safety Administration notes that lane splitting is “a means of reducing congestion,” which is especially important on busy California roads. Drivers should never attempt to dissuade a motorcyclist from passing or splitting in any way, as to do so is both extremely dangerous and illegal. Share the road. Stay alert and focused when driving, and take special care when you notice a motorcycle. Your own eyes and ears are your best defense against accidents of all kinds on the road, and motorcyclists appreciate your care in keeping the road safe for everyone. Sometimes, no matter how safe we try to be, accidents still happen. Be prepared for everything by reading one of our free books or reports, or contact our office for a consultation to discuss your legal options after an accident.